It’s not (all) about the environment, it’s about maximizing your time and money. Here's the shocker: You can survive (even thrive) without a car! Last week marked the 2-year anniversary of when I sold my car. Been doing fine, rain or shine! The quick math says that I have saved $13,360 in those years. My out-of-pocket expenses were about $570 per month - pretty typical with a car payment, gas, insurance, upkeep, etc. Add up your own cost of driving. 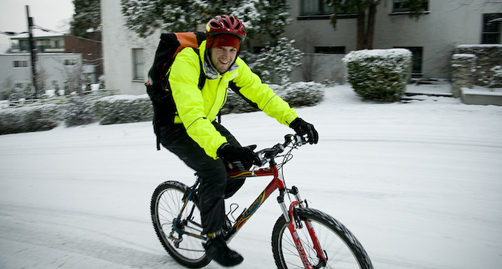 Year-round bike commuting, no problem! Maybe bike commuting isn't for you. That's OK too. Amazon Ads - I've included a few links to Amazon products throughout the site. These are there for your convenience, and maybe I'll make up a little of the cost of running the site (probably not). It's not a money maker, these are just my personal product suggestions, get 'em wherever you like! Share your ideas, stories, arguments - whatever. Every single submission will be read and carefully considered - I promise. Useful information will be added to the site.